Far flung galaxies whose emissions are powered by supermassive black holes have been identified by NASA’s Fermi Gamma-ray telescope - the farthest detection of this kind to date. These luminous galaxies, known as blazars are the most distant ever detected and are expected to shed light on the cosmic evolution of black holes. 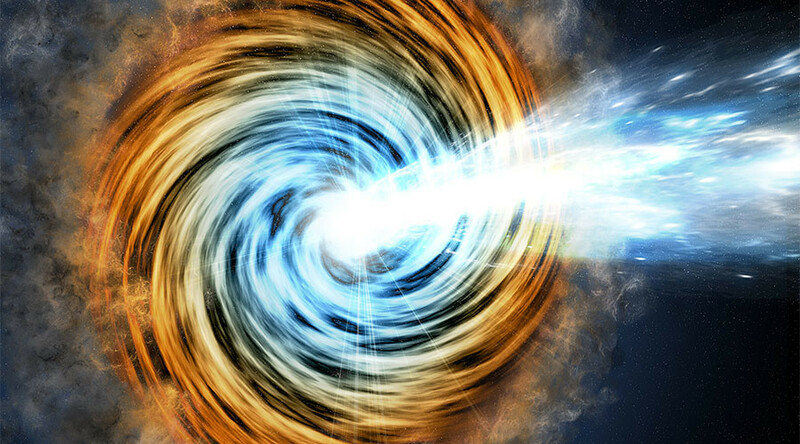 Blazars are among the brightest objects in the universe thanks to emissions powered by supersized black holes. "That they developed so early in cosmic history challenges current ideas of how supermassive black holes form and grow, and we want to find more of these objects to help us better understand the process," Roopesh Ojha, an astronomer at NASA's Goddard Space Flight Center said. Blazars are similar to all active galaxies, acquiring energy from matter falling toward a central supermassive black hole. A small part of this infalling material becomes redirected into a pair of particle jets, which blast outward in opposite directions at nearly the speed of light. “What makes blazars so intense is that we happen to be looking almost directly down the jet,” NASA explained. Of these five blazars, two boast black holes of a billion solar masses or more. One of the blazars hosts a black hole with a mass of about 3 billion suns - 700 times bigger than the black hole at the centre of our galaxy. Fermi’s discovery confirms that large black holes formed early in cosmic history, however, it’s still not clear how they developed. One astronomical theory is that the formation occurred over time through a series of mergers with smaller galaxies. Scientists are hopeful that they will obtain additional examples from the Fermi telescope which will enable them to answer this question. "We think Fermi has detected just the tip of the iceberg, the first examples of a galaxy population that previously has not been detected in gamma rays," said lead researcher, Marco Ajello from Clemson University in South Carolina.